“Sol Latino” understands the need to increase social perspective and is making an effort to shed light on the social and political situation here in Guatemala. We are working to provide the help that is needed throughout the city of Quetzaltenango and other towns nearby. With this goal, the school works closely with different social organizations (NGOs) such as Caras Alegres, Corazon para los Niños, Xela Aid, Hogar Abierto, as well as with other local organizations, where our students can volunteer their time. A part of you week’s tuition for classes goes directly to support these projects and a part of your registration fee is used to support the social organization which, at the time, is in need of donations to use for expenses, special activities, and materials. This project works with street children in Quetzaltenango. The Foundation Corazón para Los Niños (“Heart for children”) strives to give these children a better future by offering education. In 2004, three schools were closed down in Xela because of the withdrawal of financial aid by sponsor countries; these were schools that specialized in the education of child workers and protected one of the most fundamental rights of these children: the right to primary school education. With the closure of the schools, the hope for a better future fell apart too. The Foundation Corazón para Los Niños aims at re-opening the closed schools with an alternative form of elementary schooling, intended for children aged 8 to16; at the same time these same schools would offer a place for somewhat older kids. The social climate in Guatemala now guarantees that the children who really want to attend school and have the support of their parents – and often with local aid - can learn mathematics and writing, and have the prospect of a better future. Xela Aid isa non-profit, non-denominational humanitarian organization, that responds to the requests for assistance from economically disadvantaged communities in Guatemala; the project responds in a manner that restores the health and well-being of the people and their environment, while promoting cultural understanding, and preserving their dignity. Founded in 1992 as a medical aid project, the work of Xela Aid continued growing until it converted into a full-blown development project with an office in San Martín Chiquito, near Quetzaltenango (Xela), Guatemala. The Xela Aid medical and dental clinic attends more than 10,000 people in need, the medical clinic houses 40 midwives who attend more than 2000 births per year, and they have a small pharmacy. 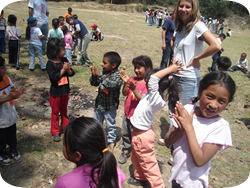 Under the umbrella of Xela Aid there exists an educational project that makes it possible for children to go to school and they host a collaboration program that helps cover the costs of school fees and supplies. In addition, Xela Aid realizes medical and dental campaigns, and they provide classes in English, health, hygiene and the environment. In 1996, Hogar Abierto opened its first home for a year; in 1999 the home was re-opened and became a place to care for children and adolescents street workers living in extreme poverty. The home is a crisis center that provides food, education, recreation, employment, and medical and psychological care on a daily basis; it is a safe place for street children to live, and means avoiding having to live on the streets permanently. At the same time, it is a transitional home providing a step in enabling these children to return to their families and develop positive expectations in life. In the process of reintegration, the beneficiaries have seen positive results. It is a place that allows the boys and girls to prepare themselves not only for a reunion with their families, but also reintegration in their schools. The only requirement for admission of children and adolescents is a willingness to change his or her life. If you are interested in working in these or other projects, the staff at “Sol Latino” will work together with you to find the social projects to match your desires and abilities. If your time in Quetzaltenango is limited, or you would like to focus your time on language study and travel, we appreciate your desire to help in any way you can. There are other ways to help in our community. This is one reason we organize visits and excursions to the social projects in and near Quetzaltenango. In addition, participation in different activities also benefits the different social projects. We continue to maintain contact with the organizations and projects to keep you informed of changing activities as the weeks progress. We would be happy to let you know how you can help appropriately and responsibly with your participation, time, money, and other forms of help. Sol Latino Spanish School © 2019. All rights reserved.